We have been designing and manufacturing LED drivers and electronic fluorescent ballasts since 1996. Our mission is to provide our customers with innovative, cost-saving and quality power lighting products that advance energy-saving technology. In addition, our reputation for producing both ballasts and drivers for extreme temperature applications is second to none. Our power supplies have been installed in such places as NASA Space Center, the Cleveland Browns Football Stadium, Texas Tech University, Tampa Bay Rays Stadium, Sax Fifth Avenue Department Stores and many more world-wide locations. AC Electronics offers on-staff engineers for advanced technical support that is just a phone call away. We can answer virtually any application or installation question you may have, toll-free, immediately. The proven reliability of our products is well respected in the industry. AC Electronics has, at its disposal, the latest automated industrial equipment for high volume, critical quality production; fully supported by strict ISO-9002 Q.C. certification. All of our products carry a 3 or 5-year full replacement guarantee against manufacturing defects as well as labor replacement costs. Please see our warranty page for further details. Access our specification sheets on our website or call or fax us today and see for yourself why AC Electronics is becoming the #1 supplier of LED Drivers, LED Retrofit Solutions and Extreme Temperature-Rated Electronic Ballasts in North and Central America. 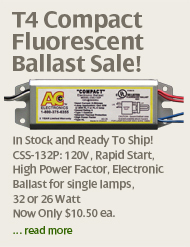 If you have any questions, or to request a Free Catalog of Electronic Ballast, Fluorescent Ballast and Fluorescent Lamps, and/or LED Drivers and LED Lamps, call us toll free 1-800-375-6355 or email us at administration@ace-ballast.com or you can submit an Inquiry Form.